Pianist Ramon Alexander . . . a study in concentration when he is immersed in his music. Ramon Alexander is a jazz musician. He is actually an extraordinary jazz musician. But he’s different . . . on so many levels. For starters, he studied classical music. All the way through high school and a bit at university. Then, he hails from Mamre. A decade or two ago, that was just about as rural or country-side as you can get. Not exactly a breeding ground for jazz musicians. Okay, I’ll play nice, an oenologist is, essentially, a wine maker. Ramon studied at the University of Stellenbosch where he obtained his degree in oenology. It is the science and study of all aspects of wine and winemaking except vine-growing and grape-harvesting, which form a subfield called viticulture. So, not only can he entertain you with a jazzed-up version of UB40s Red Red Wine, he could serve up a nice cab sav or pinot noir to go with it. Mr Alexander, as I said, is a different. But, at 36, he is the face of the new generation of jazz musicians coming through in the Cape. If Ramon and his ilk are the future of jazz on the Flats, then the future is looking good. Ramon is proud of his roots in Mamre. This is only too evident on his latest album, Echoes of Louwskloof and in particular the track, Louwskloof se Mense. “Louwskloof was a place close to home where a Khoi captain, Klapmuts, and his people roamed when the German missionaries set up shop in Groenekloof [today it’s known as Mamre] at the turn of the 1800s. Louwskloof se mense were some of the first inhabitants of Moravian Mamre and were then converted to Christianity,” he says giving us a quick history lesson of the area. Ramon attended All Saints Primary School in Mossel Bay, York High in George and completed a BSc in Agriculture (viticulture and oenology) at Stellenbosch in 2004. His mother and father were English and Geography teachers, respectively. His interest in music came from imitating his older brother’s piano lessons when he was five years old. 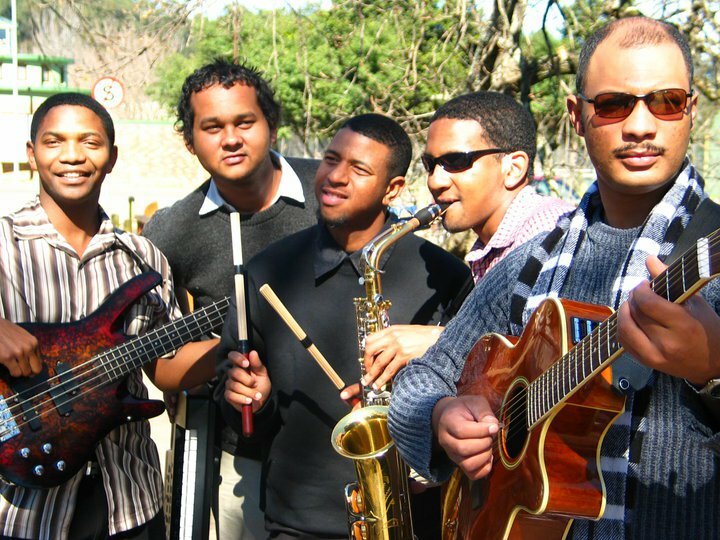 In 1998, Ramon took lessons from Cape Town’s foremost jazz teacher, Merton Barrow, and was introduced to a more mainstream form of jazz. He was exposed to the music of Thelonious Monk, Bill Evans, Keith Jarrett, Miles Davis, Herbie Hancock and Chick Corea. Initially his interest in music was purely for “personal enrichment”. He reads and writes fluently with his classical background and it has stood him in good stead when he finally took the step of forming a band. “It wasn’t until I went to university that I started a band and we played some jazz,” he recalls. “The first band that I formed was ESP, a nod to the Miles Davis tune, ESP. It was a mixed group from all walks of Stellenbosch life. Some were music students, some friends from church, some from high school. Lou-Ann Stone, an Afrikaner saxophonist from Paarl, featured on the album. White, female, Afrikaner, saxophonist? How many boxes does that tick in the new South Africa? 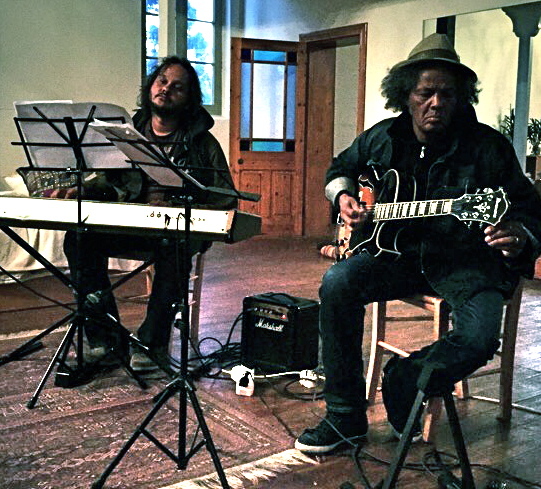 While the Moravian Church has deep roots in the Mamre community, it does not play an overly prominent role in Ramon’s musical journey. Ramon spent four years studying oenology, yet he never became a wine-maker. “I did my practical work and that was about as much a wine-maker that I was. As soon as I graduated I became a musician. My Dad wasn’t very pleased with me for a long time. My studies did not cost them a cent though. I actually got a top bursary from SAA. If you dropped in on Ramon, the chances are he’ll serve you a cabernet sauvignon or sauvignon blanc . . . “specially the ones you find here in Durbanville or from New Zealand”. At the moment, Ramon’s focus is on promoting his latest CD (is anybody going to do vinyl pressings in Cape Town? 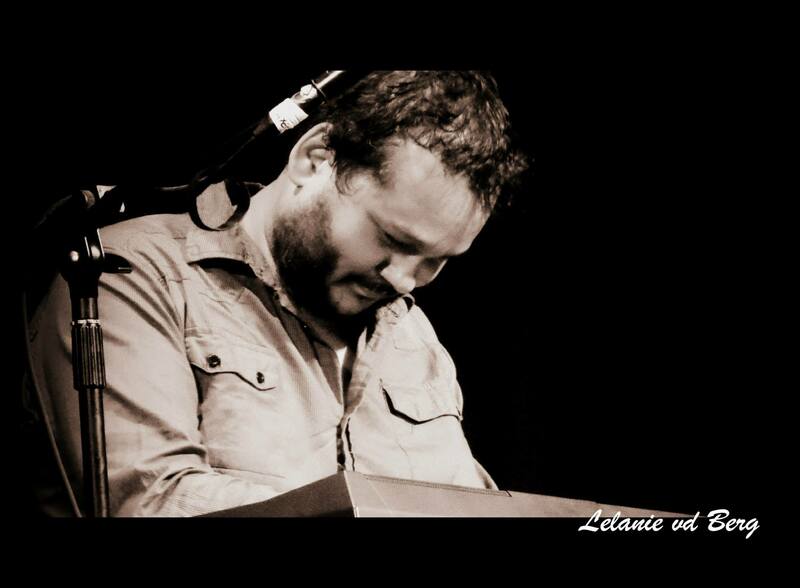 ), Echoes from Louwskloof, and his next big gig, his first appearance at the Cape Town International Jazz Festival. The CD has been a while in the making. Back in 2013, he did a show in Bloemfontein with bassist Chadleigh Gowar and drummer Annemie Nel and he asked them to collaborate with him on it. 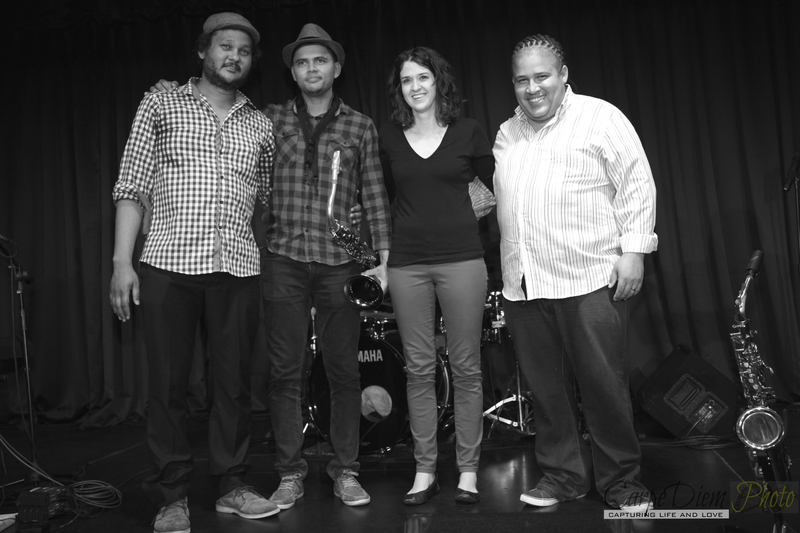 Gowar and Nel, along with saxophonist Zeke Le Grange and vocalist, Sima Mashazi now form the basis of Ramon’s group. One doesn’t like to bang on about it in our new South Africa, but . . . a classically trained boeremeisie playing jazz, drums, and ghoema to boot. Wat gaan aan? Ramon is more than comfortable with his drummer. He says his good buddy, drummer Jack Momple, rates her as one of the best around in terms of ghoema. There used to be a widely held view that white drummers couldn’t handle the rhythms of the Cape Flats. Ramon says things have changed a bit. Echoes from Louwskloof has elements of all jazz styles ranging from a complex Au Lait with interesting tempo changes, to John Coltrane’s Giant Steps, his tribute to the late, great saxophonist, to Zeke’s cool sad/happy sax work on I Wish I Knew Mankunku. It is the Sons and Captains track, however, that brings it all that closer to home. The sound is decidedly ghoema, the genre that evokes mixed emotions. The jazz purists deride it, while others embrace it as “roots music”. “I believe people like Mac Mackenzie, Abdullah Ibrahim and Robbie Jansen have done a lot to give this a noteworthy place in the jazz spectrum,” Ramon says. “Robbie always told me that they, as the older generation, introduced this music known as ghoema. Us, as the younger generation – Kyle Shepherd, Mark Fransman and all those prominent youngsters in Cape Town – we need to actually refine it and bring sophistication to it through our compositions. We must make sure the elements are still there with the refined western jazz. “Well I think, when people look down at it, to put it bluntly, they actually look down on people of colour and their cultures. Amper soos, to be socially acceptable in the old South Africa, you must be more like the white person. The thing is, it is undeniably part of our culture. It is a cosmopolitan sound coming from places like D6. The actual rhythm is from the East, rattiep. Ramon says one of the musicians he admires most, Mac Mackenzie, has long championed the cause of the local sound. Ramon’s focus is on the Cape Town International Jazz Festival on April 1 and 2 where he is being billed as the “Cape jazz” act. He will be doing his own compositions drawing on two albums under his own name, the Mountain Records’ Cape Jazz Band material and the ESP band. “That’s a pool of about 30 songs. Obviously I’m going to choose one or two of the ‘coloured’ composers, like Abdullah Ibrahim, Tony Cedras, or Robbie Jansen or Mac Mackenzie. That would be very important. Ramon is quite chuffed at getting his first gig at CTJF. “Personally, it is my biggest gig. I have played bigger gigs in the Afrikaans industry . . . you know you need to pay the bills. I play their music but I want to play my own music. It’s not bad music, that’s not what I’m saying. It’s not my music. It pays the bills. At 36, Ramon is a making a living out of playing. He is ready, though, to move on to the next stage of his musical experience. “This year my manager and I have decided on a new venture, we are opening a studio. Things are looking much better. It’s more like 9-5 type of work also for me. So I get chance to play and practise and produce music. He has left the teaching world knowing that there is enough jazz education happening to ensure that exciting new talent will be coming through. “There is a lot of teaching going on, even at school level now. The kids are playing quite advanced music at the moment and the universities are offering degrees in jazz. “The future looks good with youngsters coming through. For me, it’s just a question of I like to see jazz musicians with their own voice and with their own ideas, not to be enslaved to this whole jazz thing. It’s good to learn it but you need to do something with it. With Momple, Dyers and Mbadu in the Cape Jazz Band. I’ve only heard Ramon Hector Alexander play live once, at The Crypt with Jack Momple and Spencer Mbadu (sometimes it’s just not possible to drop into his latest gig), but I was quite taken with what I heard that day. Now I have to make do with the offerings that pop up on You Tube. Or listen to tracks from Echoes from Louwskloof. I think I’ll do just that now . . . a nice dry white will go down well with the soulful Louwskloof se Mense followed This Is The House that Jack Momle built, a tribute to a father figure. In the meantime, let’s hope the oenologist doesn’t give up his night job! GTFT . . . Google the F**king Thing!! Jack & I really enjoyed your session at the CTIJF Ramon. Such a sophisticated sound.